We are exactly one week into the new year of two thousand ten today. A few days ago Greg, Eve and I watched a film titled the Quantum Activist featuring the pioneering scientist Amit Goswami. Amit asks “What are you doing to participate in the creation of the reality we all share?” Part of my participation is with this Perfume Illuminated Project I am co-creating with Beth. As ideas percolated to the surface for the debut installment I settled on beginning with something simple, on my end, that would lead to more complexity down the road. I looked at several old formulas for an array of books and settled on the creation of a tincture. Benzoin and Orris came up repeatedly as tinctures utilized in perfume formulations. Thus, after some discussion with Beth, we settled on a tincture of Orris Root. Orris Absolute is, in my opinion, one of the most beautiful raw materials available to the perfumer to work with. The aroma has the sweet floral aspects of violet balanced with a powdery, woody note. Derived from the rhizomes of the Iris Pallida it is a raw material that demands quite a bit of mastery and diligence to derive the essence from. As Beth and discussed Orris and its violet aroma she mentioned that she has a recipe for candied violets. This reminded me of the violets in my mothers garden. After getting off the phone with Beth I called my mother about the violets, she said that the violets had just started blooming and she had been meaning to tell me. PERFECT! Thus, our project today is centered on the aroma and flavor of violets! 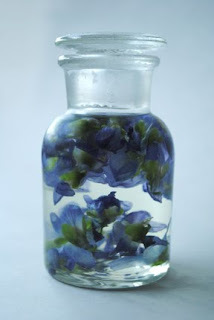 I will share here how to create a tincture using fresh violets as well as a tincture of Orris. Further in the post you will find glorious Beth's contribution which includes a story and a couple fabulous recipes. Clean glass jar with a firmly fitting lid, sterilized if possible. Ideally use an aged powdered Orris Root. Orris Root, albeit not the aged version, is fairly easy to obtain for sellers of bulk herb. A high proof alcohol, ideally Ethanol but a high proof Vodka will work. I use a beverage grade organic grape and/or grain alcohol for all my tinctures. In the past I have used other types of ethanols as well as Vodka. A tincture of Orris Root is very simply made by combining the powder with alcohol. I weigh each material, generally in equal parts or 1 part raw material to 2 parts alcohol. Once the two are combined it is best to shake daily and store in a dark place for at least a month. Orris takes a very long time to release it’s aroma, the longer the better. When the alcohol has taken on the aroma of the Orris filter the solution through a coffee filter. Be aware that some materials require repeated filtering. In some cases I filter first with cheesecloth and secondly using a filter. To create a Violet flower tincture the process varies slightly. Begin with a clean glass jar with a firmly fitting lid, sterilized if possible. Access to a daily supply of fresh violet flowers is important. Place the flowers and alcohol into the glass jar. Every few days remove the spent flowers and add a fresh supply. Do this for a month or more, until your alcohol has absorbed the aroma of the flowers. Once your tincture is ready you can use it full strength as a special perfume or use as one component within a perfume. Violet tinctures are also used cosmetically and medicinally. When Roxana called me and asked me if I'd like to be a part of creating "Perfume Illuminated " I absolutely jumped at the chance. 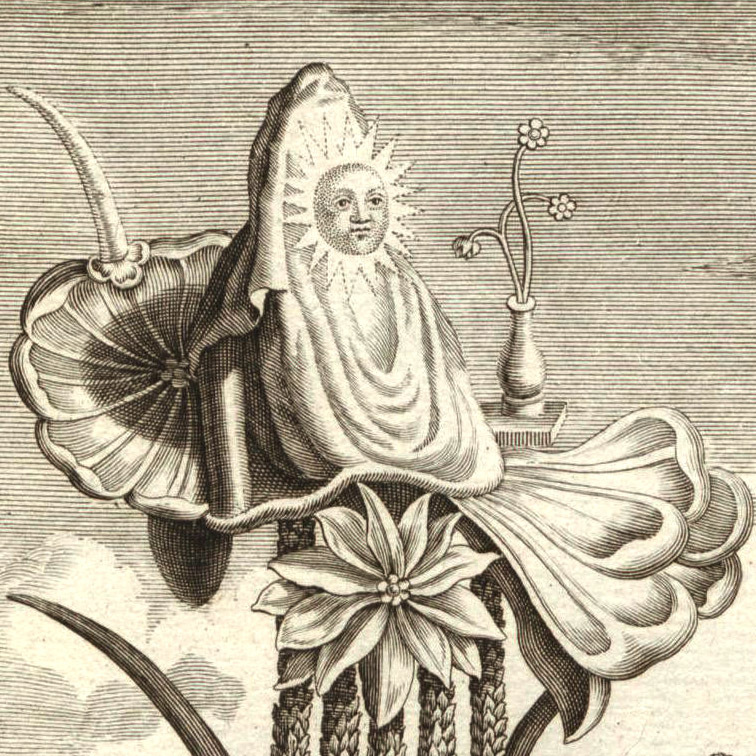 I mean who in their right mind would turn down a chance to play with the alchemist herself, the undisputed High Priestess of gorgeous botanical fragrance! We began to speak of our shared love of food , perfume and of the relationship between the art of cooking and the art of creating extraordinary natural fragrances. We weren't exactly sure how it would work so we began to explore all sorts of possibilities. 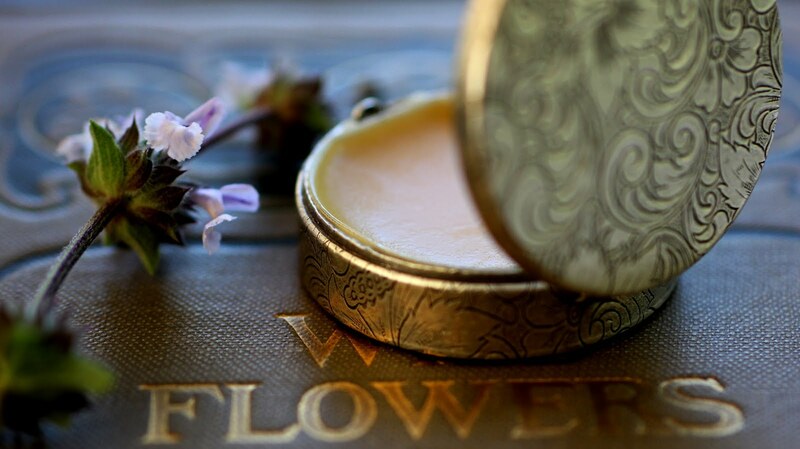 We spoke of orris root and its sensual similarity to the ethereal smell of the sweet violet. I started craving candied violets chopped into ice cream and she started dreaming of violet perfumes. I started dreaming about my husband wearing the violet ice cream and she of tinctured candied violets. Suddenly her mother called with the news that the violets in her garden were beginning to bloom. We laughed at the synergy that had just blossomed between us and here we are. 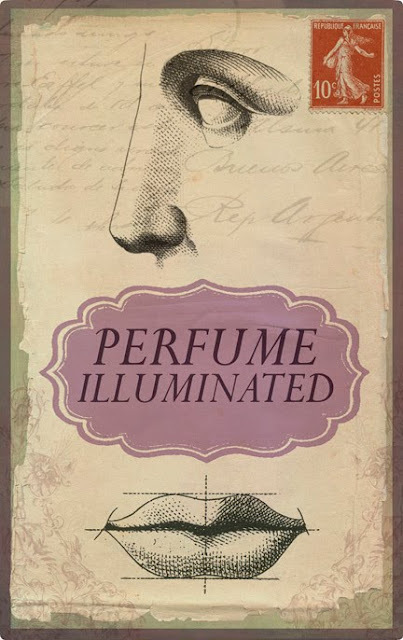 Many of you have who have read my various postings here and there know that I have had a love affair with violet perfumes practically since birth. My mother had a beautiful little burgundy velvet jewelry box and inside of it were the treasures that she held closest to herself, her mother's ivory hair combs and diamond watch, a wedding ring or two, a gorgeous pair of mother of pearl opera glasses and my favorite thing of all, a little cobalt bottle with a ancient gold label that read "Attar of Violets" that belonged to her grandmother. I used to sneak into her dressing room and close the door and then in a very personal ritual for a 7 year old I would open the lovely little box and touch each piece in it, saving the little bottle for last. 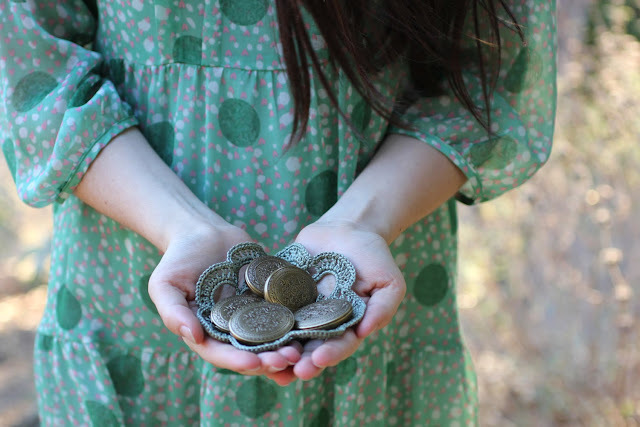 Slowly, I'd open the top and clasping it with both hands hold it up to my face and take a deep breath. There was something so magical about the fragrance and it brought visions to me of a life that I'd yet to experience but I knew would someday be mine. When my mother died, we kept the little velvet box intact and it still brings a thrill to me every time I open it. I still love the smell of the little violet perfume, although it is slowly beginning to fade. But over the years I've developed my own favorites, Givenchy's sparkling L'interdit , Penhaligons effervescent Violetta and the very traditional Violetta di Parma are but a few of the sweetly scented perfumes that I love and wear on a regular basis. 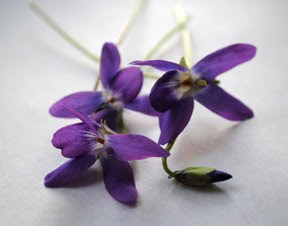 The Viola odorata or as it is commonly referred to "Sweet violet" also has many healing virtues as well as being an absolutely delicious ingredient in many recipes. Violet flowers and leaves mixed into salads are one of my favorite spring remedies for a sort of pre-menstrual melancholy and when chopped liberally into virgin olive oil with some fresh comfrey leaves;they make a poultice that soothes rashes , irritations, sore muscles and tender breasts. When infused into a simple syrup they will enliven fresh lemonade or an elegant champagne cocktail. If you are going to make the lemonade, freeze some of the pretty violet flowers into ice cubes to use in your glass. There's really nothing prettier! When I was 23, I met Jim and shortly after we married we bought a small farm in Burton, Ohio complete with a century home and small barn and several acres of unspoiled land , nestled on a little bit of hillside with an artesian spring that bubbled up down by a little oak grove, providing me with fresh watercress whenever I desired. We named it Windesphere, the place where the winds and waters met. I'll never forget that first spring. As the snows thawed I began to see what treasures were available in the gardens. First there were the snowdrops that dotted the hillside like a blanket of down and then the buds started to appear everywhere. I found a quince bush and several heirloom apple trees and a blackberry grove that was to produce the most luscious berries that I'd ever tasted. I will never forget the vision of my young son running towards me covered in sticky purple juice and holding out his little hands that were cupped and tenderly cradling the warm berries that he'd picked to share with me. fragrance…something just a bit sweet and very green. All of sudden the fragrance was so strong that I couldn't ignore it and it was then that I looked down. Hidden in the grass all around me were the most beautiful little violets in shades of deep purple, lilac and white and the smell was the most intoxicating thing that I'd ever experienced. Over the years I picked them for little bouquets, learned to crystallize them for desserts and made them into massage oils , tinctures, vinegars and syrups. They appeared every spring growing more abundant every year and I will always remember Alex lying face down in a huge patch of them and whispering for me to join him. In honor of all of those memories I've made a violet ice cream featuring a lovely Teavana white tea blend that features some beautiful crystallized violets and thick and sticky blackberry jam. This Ice cream is so rich and creamy that it's practically obscene, a virtue that I love in both my men and my food! Because I'm here in Ohio in the midst of a gorgeous blizzard there are no fresh violets to be found and sadly no violets to crystallize. If you've never had them, crystallized violets are absolutely beautiful, sparkling little jewels and much better than candy. I became truly addicted to them the very first time that my sister brought them home from Paris for me. Fortunately they are very easy to make. All you will need are fresh violets, beaten egg white that's not frothy, superfine sugar and a soft sable paintbrush. 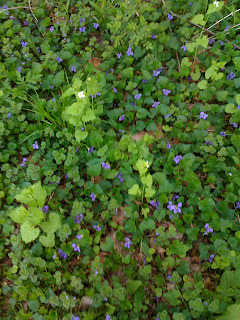 Spring is the time of year to make them because you can find fresh violets everywhere you roam. Just make sure to harvest them from areas that you know haven't been touched with pesticides because you will not be rinsing them. Paths through the woods are usually perfect! Dip the brush into the egg and gently apply the egg white very lightly to the violet, covering the whole flower or petal. Don't use too much, only enough to allow the sugar to stick. Then turn the violet upside down and while holding it over a plate, sprinkle with the superfine sugar to coat it evenly. Place them on a tray that you've line with parchment and allow them to completely dry. You can hasten the process a bit by putting the tray into a 150 degree oven with the door left ajar. They won't be around for very long, but once they are completely dry you can store them for up to a year in an airtight jar. The Teavana blend that I¹ve used to create our ice cream is called "Lavender Dreams" and it's incredibly beautiful to look at as well as drink. 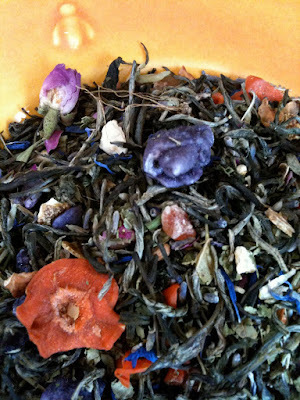 The ingredients are white tea, candied violet flowers, lavender blossoms, apples, raisins, papaya bits, peach pieces, orange peels, carrot slices, verbena, pink rose buds, cornflowers and passion flower blossoms. Add a little white chocolate, blackberry jam , a bit of vanilla and voila ! Combine the cream and coconut milk in a sauce pan and bring to a shallow boil. Whisk in the agave nectar and vanilla, then turn off the heat. Add the loose tea and let it infuse for at least 15 minutes stirring occasionally. When the flavor is as bright as you want it to be, strain the milk mixture through a chinoise and press the tea through the strainer to extract the maximum essence. It will still be quite warm. Put the milk /cream into a Vitamix or other high speed blender and add the chocolate, violets and jam. Turn the blender on and adjust to one of the highest settings. Add the egg yolks and blend for a minute or two. Pour the custard blend into a dish suitable for freezing or if you¹re lucky enough to have an ice cream maker use that! Freeze until solid, garnish with some of the candied violets, a light shortbread cookie and enjoy! This recipe will easily serve about 6 reasonable people or two very greedy ones...you decide! Many thanks to the delightful Victoria at my local Teavana in Beachwood, Ohio who helped get me all of the candied violets that I needed for this recipe! To my mother, you'll probably never know just how much I miss having tea with you at the Drake Hotel in Chicago, eating fancy sandwiches and just laughing about love and life. And last but not least to my husband Jim who gave me a farm even when he didn't want one and my son Alex, whose chubby little blackberry stained fingers will always be one of my sweetest memories. 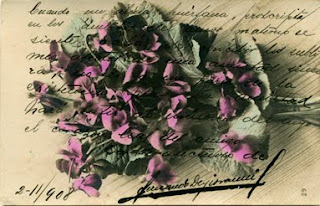 Images: Top image "Perfume Illuminated" has been created by Roxana Villa, Postcard is from a collection of old family postcards, photos of violets and violet tincture by Roxana Villa. 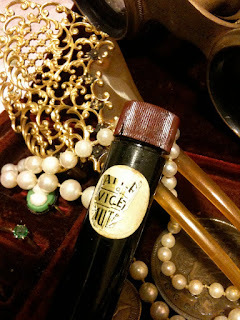 Perfume vial tea photo by Beth. Thank you both for sharing such beautiful memories, recipes and instruction for stimulating all the senses in only ways you can! Okay, this is officially the most delicious post EVER! I share your love of violets, and my own mother had a violet perfume that I used to sneak in and smell! I can't smell violet scents without thinking of her. And you really had me a the violet ice cream. The idea that such a delight actually exists and can be made at home - swoon! Thank you for the lovely imagery. It's almost time for the little violets in my backyard to bloom here, and I always know spring is really on the way when I smell their chilly, evanescent aroma on the breeze. I'm with you Flora, can't wait until the pop-up violets raise their little heads!